Latitude 38 Bistro & Spirits is a spectacular bistro very well-known to the locals as well as the tourists. Situated at the entrance of the quaint town is a dining experience no one should miss! The dinner menu, which changes every two weeks, features the finest cuts of beef, pork, lamb, chicken, fresh local seafood and produce all served in full and half entrée options. The decor features hand painted murals throughout the formal dining rooms as well as various works from extremely talented local artists. Dining options include a casual bar setting or a candlelit room with white linens. Transportation is complimentary to and from the Oxford marinas. Please call for reservations. Open for Lunch, Sunday Brunch and Dinner in the Fall in Winter. Open Dinner and Sunday Brunch in Spring and Summer. Closed Mondays. Now delivering to your door! Doc’s Sunset Grille – Great bites. Great friends. Great atmosphere. and of course, GREAT sunsets! Tiki Bar and outside dining available. CAPSIZE- Oxford’s newest restaurant on the water. 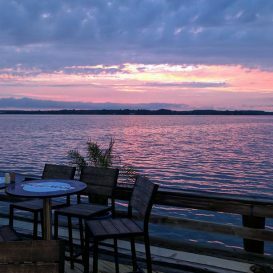 Arrive by land or by sea and relax with a drink on our deck overlooking Town Creek or dine in our waterside dining room. Comfortable lounge seating and dining options both inside and out. Capsize serves American Cuisine on the sparkling waters of Town Creek. 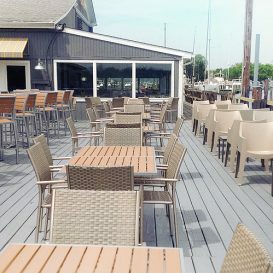 It’s a place locals like to frequent, where you can grab a drink and enjoy the waterfront dining experience with friends, family and even Fido in a casual, relaxed and friendly atmosphere. If you are coming by boat, we have free dockage while you dine, and overnight space is available as well for a nominal fee. Next to the Creamery! 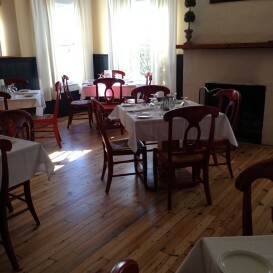 Pope’s Tavern, a European Bistro at the Oxford Inn offers a casually elegant dining experience. The cuisine of Chef Lisa MacDougal is prepared with only the freshest ingredients. We have: An intimate 40 seat dining room, a charming library lounge, offering cocktails, wine, starters and desserts. Private Dining Room available by reservation for small dinner parties. Give us a call for a particular seating or an exclusive reservation. Teak bar with 12 seats offering a carefully selected grouping of European and Domestic wine, beer, your favorite spirits, and showcasing our favorite, the brandies of Spain. Salter’s Tavern and The Robert Morris Inn – Once the home of Robert Morris who gained fame as the “Financier of the Revolution.” Enter the Inn and step back 300 years… A pristine yet historic interior welcomes you with timber beams, paneled walls, and open fires in the cooler months. This is truly a historic Inn, cosy with a natural patina running through. Friendly atmosphere, great cuisine, and understated professional service! 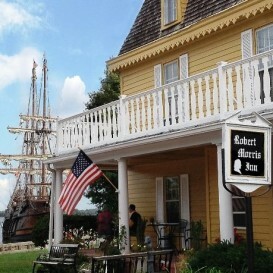 Now the Eastern Shore’s most unique historic restaurant under Chef Proprietor, Mark Salter. 2 for 1 Offers midweek during October, November, and December! Be sure to check the schedule for special Cooking Demonstrations during the winter months. The Oxford Socia l Cafeis a coffee shop located right next to the Town Park in the heart of Oxford. We serve delicious coffee drinks using RiseUp coffee, various teas, and scrumptious baked goods from Turnbridge Point. We also sell pints and quarts of Scottish Highland Creamery ice cream. 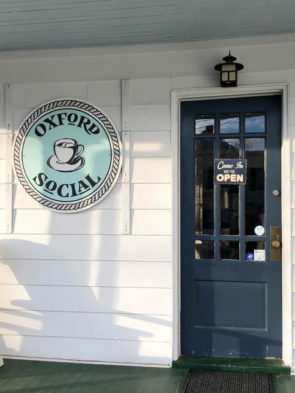 The Oxford Social is a welcoming gathering place for both Oxford residents and visitors alike. Hours vary depending on the season so please check our website often or visit us on Facebook!